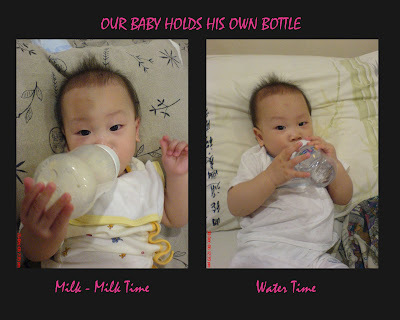 After the discovery at auntie’s place, nowadays I will let Ryan hold his own bottle be it for milk or water. Often he would just let go and kinda still expecting mummy’s extra hand.. not anymore baby. You have to learn to do it without mummy’s help.. but at times he would surprise us with a show of his little stunt by holding the bottle single handedly. Ryan’s hair has grown a fair bit and it’s getting a little messy esp near the ear area. 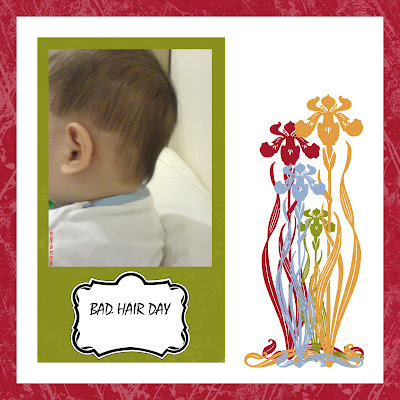 So, pandai pandai (smartly) we decided maybe we could attempt to give our baby a quick trim. Smart Daddy suggested we use his shaver which has this trimming feature which we thought it’s a brilliant idea cos our baby won’t risk having a cut knowing he’s such a hyper. So, Daddy picked up the shaver and voila.. our baby had his firt virgin hair trim. This is the outcome….sigh.. big sigh…..poor baby. Anyways, back to Ryan’s tossing and turning.. somehow mummy and daddy has grown to be quite ignorant too and would usually try to settle him with a few pats to assure him we’re around. It is also through this we’re hoping he’ll soon learn to understand it is okay to wake up and fall back to sleep on his own without any feeding/excessive stimulation from us. Finger crossed. So far so good. As mummy is typing this out, Ryan is already asleep since 10.30pm. Sweet dreamsss baby. Muaks muaks. I never failed to give Ryan goodnight kiss eventhough my baby is already asleep – a habit I’m trying to instill between our baby and us. Heehee.. just like Mr Lim would always give me a goodnight kiss before he dozes off (missed a few times because he was toooo tired already. Sob sob.. so tired meh Mr Lim? Anyways, forgive you la) and a goodbye kiss before he leaves for work in the morning (this never missed before). Yeakss.. very ‘yok ma’ hor. Heehee… Love my two babies. Ryan who saw his poor mummy fell was about to start the pitiful cry of his. So I quickly stood up, composed myself, gave him a few assurance pats on his back and distracted him with other things. (Though down my knees were like yelling super painnnnnnnnn). But but, most most importantly my cutie is alright. Luckily nobody saw the whole episode, else really paiseh!! !